SHAK has 12 outlets in Saudi Arabia already. China is no stranger to the hamburger, thanks the thousands of McDonald's (MCD - Get Report) that have proliferated in the country since the 1980s. But now, the People's Republic will get to experience the ShackBurger. Shake Shack, Inc. (SHAK - Get Report) will open its first outpost in mainland China in 2019, the company announced last week, following a debut in Hong Kong. By 2028, it plans to have 25 locations in Shanghai and East China, as well as 14 in Hong Kong and Macau. The so-called "fine causal" chain, founded in 2004, has over 137 restaurants worldwide, including 12 in Saudi Arabia. Why did it take so long to reach China, where fast food has thrived for 30 years? The Yum! Brands, Inc.-owned (YUM - Get Report) Kentucky Fried Chicken, for instance, now has over 5,000 locations in China. Pizza Hut, also owned by Yum, has nearly 2,000. According to Shake Shack CEO Randy Garutti, it was a matter of finding the right domestic partner. "We've always been patient and deliberate with our development strategy," he told TheStreet in an email statement. In 2014, the company began its relationship with Maxim's Caterers Limited, Hong Kong's largest restaurant chain. 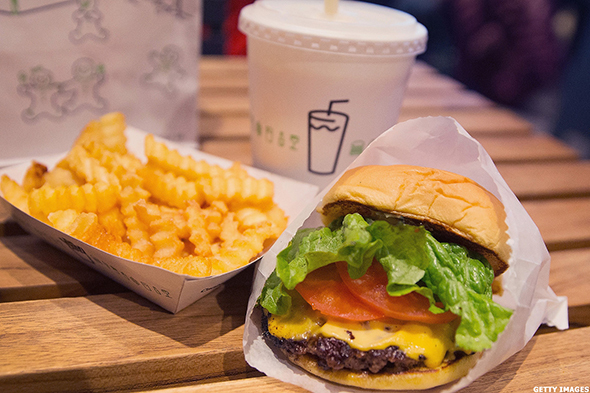 Shake Shack Burger and Fries. But Shake Shack won't be without competition. Both Hong Kong and Shanghai, for instance, have Caliburger, a knockoff of In-N-Out Burger, Inc. that has more international locations than domestic. Shanghai has enough of a burger scene that it warranted a TimeOut "best burgers" list. The menu will include classic items like the ShackBurger, crinkle-cut fries, Shack-cago Dog and frozen custard, but there will be some variation among the restaurants based on location, Shake Shack said last week. The restaurant beat Wall Street estimates with its second-quarter earnings, with 14 cents per share on revenue of $66.5 million, it announced on Aug. 10. Shares fell almost 10% this past month after Shake Shack cut its sales outlook.